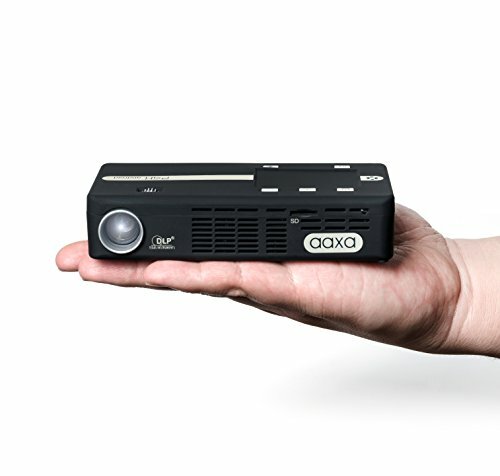 The AAXA P4-X Android is a feature-rich upgrade to the popular P4-X Pico Projector. At the heart of the new P4-X Android is a new smart-CPU enabling Wi-Fi connectivity, Bluetooth radio, and operating on the Android Lollipop platform. Now P4-X Android users are free to connect to the internet and access a myriad of applications including video streaming, Office viewer, smartphone mirroring, and much more. Retained on the P4-X Android is an award-winning 175 lumen optical engine with 20,000 hour LEDs capable of producing a 120" image in dark areas and powered by Texas Instruments DLP Technology. Native WVGA resolution with 1080p Max Input, featuring Texas Instruments DLP Technology to achieve crisp and clear image. 175 Lumen optical engine with Vibrant Color Technology. 20,000 hours Premium LEDs ensure there is no need for lamp replacement. Android OS 5.1 (Lollipop) for Apps, Streaming Videos, Smartphone Mirroring, and more. Onboard streaming applications include YouTube, Netflix, Hulu, Twitch, and Crunchy roll (subject to change). Onboard WPS Office Viewer (PDF, PPT, DOC, XLS) provide business capabilities right out of the box. Wide range of connectivity - Wi-Fi (b/g/n), Bluetooth, mini-HDMI, mini-VGA, 3.5mm Aux Out, Composite A/V along with microSD and mini-USB readers. Built-in Speaker. Ultra portable at 5.5" x 2.8" x 1.2" size and weighs only 1.37 lbs with a 90 Minute Rechargeable Lithium-Ion Battery. Includes power adapter. Perfect for Business and Home use with up to 120" projection (in low light conditions). Built-in touch pad for easy navigation. Includes remote and mini tripod.